Lapinette clutched her book as if her life depended on it, because she had found some surprising information on Genetically Modified vegetables. 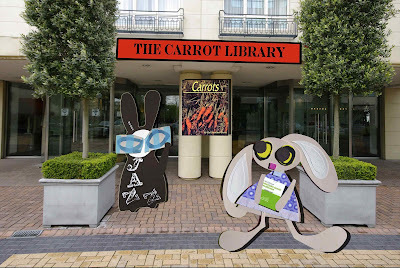 The Wabbit emerged from the library and hailed her. "Do come in Lapinette, everything’s laid out for your research," he cried with some glee. "I never knew the Carrot Library existed," said Lapinette. "Oh it’s very new," said the Wabbit. "It’s an independent venture of the Carrot Club." "Of which you are this year’s Grand Daucus,” said Lapinette kindly. 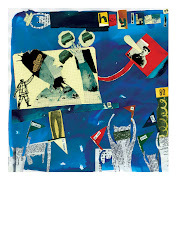 The Wabbit bowed gravely. "Who pays for it?" asked Lapinette. "The Carrot Club does, through public subscriptions, private grants and fund raising events," said the Wabbit proudly. "No Department of Wabbit Affairs money then?" said Lapinette slyly. "Not as such," said the Wabbit. Lapinette looked at the Wabbit and inclined her head. "The Agitprop section has a special books, stationery and apparatus allowance, part of which I cause to arrive here," admitted the Wabbit. Lapinette was used to the Wabbit’s unorthodox, yet somehow fair budget adjustments. "Did you find the Skarrot locator device?" she ventured. "I did," said the Wabbit. "It can identify any rogue carrot within a distance of 400 kilometres." "What constitutes a rogue carrot exactly?" said Lapinette. "Arms, legs, eyes, bared teeth and a voracious appetite," said the Wabbit. "What do they eat?" said Lapinette. "Everything that gets in their way," said the Wabbit.